Services are available. Please make an appointment to speak to the GP. See Midwives – Antenatal section below for further details. Every morning Monday to Friday, by booked appointment, with one of our Phlebotomists. The first 2 appointments of the clinic are reserved for fasting blood tests. Please contact a receptionist to arrange an appointment. More frequent smear testing is available privately at the BUPA Hospital. This treatment is available on request from Dr Wilson. These are held in October/November every year for all 65 year olds and over and anybody with increased health risk of complications from influenza. We conduct minor surgery sessions (treatment/ removal of medically necessary lesions e.g. recurrently infected cysts/ in-growing toenails). These are performed by Dr Peel; appointments can be arranged through the doctor. We do not offer a service for skin lesions needing removal for cosmetic reasons these are referred to GP Care who offer a private service. Stop Smoking Advice is available from the GP. We also provide one to one appointments with a stop smoking advisor. There are local Stop Smoking Groups available within the community. Please ask for details. Our travel service is currently suspended but we do offer certain vaccines, some which are charged for, but most of which are free - please see table below. 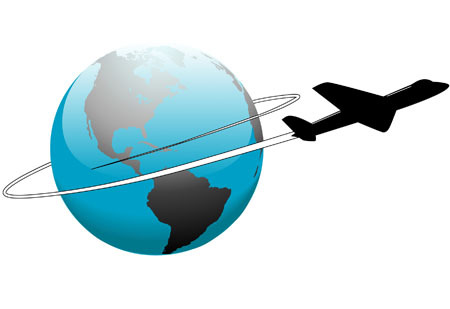 NOMAD are able to offer free travel advice. Please visit their website http://www.nomadtravel.co.uk/. * If you are undergoing a course of vaccines, these must be paid for prior to commencement of treatment. Certain services such as private sick notes, insurance claim forms and some medical examinations are not covered by the NHS and charges are made in line with The British Medical Association recommendations. Please see leaflet for details of Private Charges. MIDWIVES – ANTENATAL CLINICS - If you are pregnant you will need to register with the Midwifery Team who will provide your antenatal care during the pregnancy. The Midwives covering our practice are based at Bedminster Family Practice and BS1 Surgery (part of Bridge View Medical). Please contact the antenatal booking team on 0117 342 0850. HEALTH VISITORS - All children aged 0 - 5 years will have a named Health Visitor. If you are new to the practice you will need to register with the Health Visiting Team. The Health Visitors covering our practice area, are based at several locations, please contact the team at Compass Point who will be able to provide further assistance. Telephone 0117 378 1112, Address: Compass Point, South Street, Bristol, BS3 3AU. DISTRICT NURSES The District Nurses can be contacted on (Tel: 0117 377 3356). They will visit housebound patients only to assess them for a variety of medical conditions and, where necessary, to carry out services such as blood tests and leg dressings, etc. Unity Sexual Health provide a confidential service which anyone can self-refer to (or your GP may wish to refer you here if needed), for advice, tests and treatment if needed. 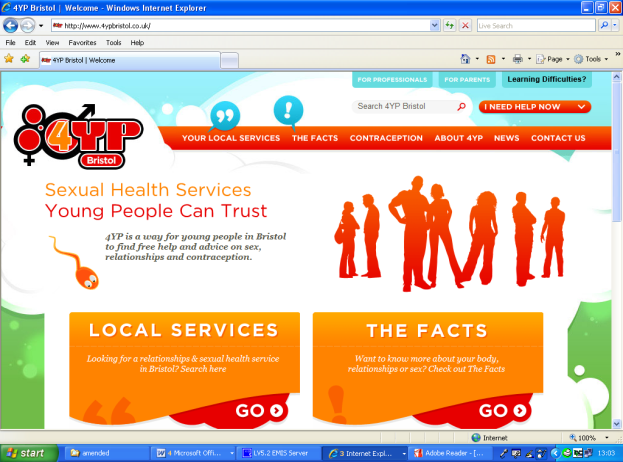 Brook provides free and confidential sexual health services and advice for young people under 19. You may be asked by various commercial organisations e.g. insurance companies, or by government bodies, e.g. driving authorities, to have a medical examination. This is not a part of the GP's NHS duties and therefore there is a charge for this work. If you require a medical report for insurance purposes please contact your Insurance Company who will send the appropriate paperwork, with your consent, through to the surgery. Paperwork cannot be completed without your consent. The surgery will complete the paperwork, where appropriate. If you sign to say you wish to see the report before returning to Insurance company, you will be notified when completed, so that you can visit the surgery to read it. There will be a charge for these reports - you should clarify with your insurer who is liable prior to making your request. In addition to the above, we charge for various other items including letters supporting appeals, private sick notes, and some travel vaccinations. Click the link below to see our current charges. 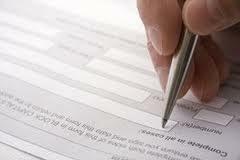 To help us offer the appropriate advice, please print off the form and return it to the surgery. Our practice team will then contact you to offer you an appointment. If you have already seen a doctor and have been advised to take time off work or feel that you may need an extension, please click on the form below and either bring it to the reception desk or fax it to us. 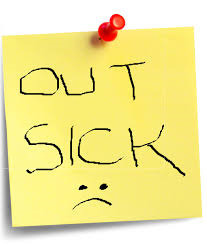 We do not guarantee that the doctor will issue another sick note. It will be processed with either a renewal or suitable instructions from the medical team within 7 days of the request.